In most instances teams are brought together as a pool of different talents and abilities seeking to accomplish common goals or objectives. For most teams, the top priority is driving success; moving towards, and, in time, achieving the goal set before them. To make this process work with optimal efficiency and drive positive outcomes it is absolutely essential to understand the dynamics of teams and how teams work. It is equally essential to develop tactics and strategies aimed at bringing individuals to an understanding of their role on the team and the role of their contribution to the achievement of the desired team result. The Five Behaviors of a Cohesive Team™ is powered by Everything DiSC® which helps teams understand how to apply The Five Behaviors™ model to their work culture. Everything DiSC is a tool that helps build effective team communication and relationships, and each team member will see how their own DiSC style influences each of the five behaviors in the teamwork model. 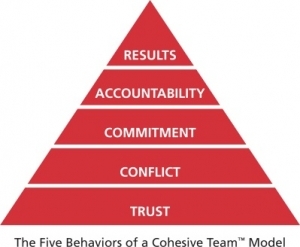 The Five Behaviors program is designed for intact teams and work groups. However, the skills learned are certainly transferrable, as most people work on multiple intact teams, be it for a function, a project, a committee or a division. DEVELOPING TEAMWORK DRIVES TEAM WORK! The evolution of trust is at the very root of the development of a strong, successful team. Teams that develop into cohesive units value each of their members and accept divergent opinions embracing healthy conflict to see all points of view. Commitment to group decisions is made easier because of the trust existing between team members and the “airing out” of concepts and ideas different among group members. Ultimately, the healthy conflict and trust factors facilitate a buy-in on behalf of the team membership that is more binding based upon the group dynamic and sense of belonging. Subsequently, this provides a well-developed sense of accountability as team members seek to support not only the objectives and goals of the project, but each other. These variables support a focus on collective results. Each component is of genuine importance to teams and merit serious consideration in their own right. However, it is the collective development of these five behaviors in unison that will most acutely influence the success of the team. Cohesive teams are more productive teams. Their decision-making capabilities are stronger and better. They make full use of talents and skills available within the team. They value their membership embracing different ideas and using conflict to their advantage. Teams prioritize driving success and generating results with a shared accountability and responsibility not only to deadlines and events, but to one another. The program also offers the opportunity to evaluate progress over time to compare how a team’s performance has changed and delineate areas of greatest improvement, and of greatest decline (and the reasons why). The Five Behaviors of a Cohesive Team™ Progress Report is for teams who have already taken the original The Five Behaviors™ assessment. The Progress Report offers productive points of discussion, and provides the impetus for action plans to further develop the team. The chart below shows the average team improvement scores reported from four random teams that ACT One International has worked with using the Five Behaviors program. The post session team scores are anticipated to vary dependent on the original assessment scores, the readiness of the team for changed, and their actual engagement levels and commitment to doing the work within and after the facilitated session.